Some responders interpreted my question in terms of skin care and maintenance items; others saw it as their favorite cosmetic product. On Facebook, guy friends chimed in but I’m not sure they were much help. With answers like “Dapper Dan’s Men’s Pomade” and “personal valet” if I didn’t know better, I’d say Jeffrey and Joe were mocking my questions (and then there was my friend Amy who listed “sunglasses” as her must-have beauty item)! The ladies took it seriously: Nivea Cream, black mascara, Mark Blemish Banisher Anti-Acne Treatment Pads, Nivea Chapstick, Estee Lauder Perfectionist Serum, Mentholatum, Clarisonic Brush. Based on how enthusiastic some of the responses were, I’m actually curious to try some of these recommendations (after reading, are you?). Which begs the question: Is there any better form of “advertising” than word of mouth by people you trust? No wonder brands have begun to engage bloggers! Michelle is gonna die when she sees that! Mucho husband brownie points!! 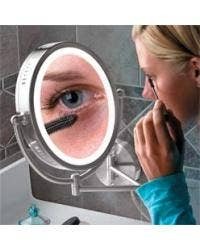 My go-to, must-have beauty product is one I didn’t need in my 30s; but with the onset of presbyopia, my favorite item is one of necessity: a high quality magnifying mirror! The one I have is Zadro’s OVLV68 Lighted Oval Dimmable TableTop Makeup Vanity Mirror; it has 8x magnification, is distortion free and optical quality. I also travel with Tweezerman’s Tweezermate travel mirror ; it’s small–about the size of a coaster–but its 12x magnification shows me “anything” I might need to take care of. The downside? You’ll see every pore enlarged to moon crater size and wrinkles will look like rivers instead of creeks. But the upside? Something you *might* not realize you need to see? Those blasted eyebrows that forgot where they live and migrated down South to your chin! Which answers my second favorite, must-have beauty item: Tweezers! Do share…we’d love to know what beauty favorite you can’t live without! Please chime in in comments!